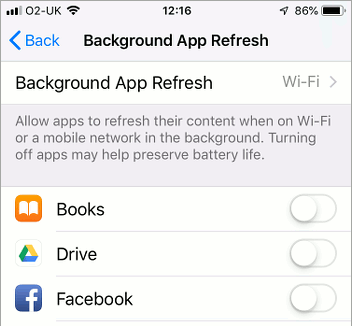 Is iOS 12 draining the battery too fast on your iPhone? Fix it! 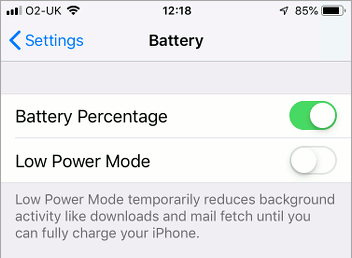 The tweaks and settings you need to maximise battery life on the iPhone and stop iOS 12 from draining it. With the right settings your phone could last all day and into tomorrow too! With the exception of the iPhone XR, which many owners say has amazing battery life, sometimes lasting two days on a charge, most people wish their iPhone would last longer. Some people cannot make it through a day without topping up their phone’s battery at some point. If you want to maximize the time the iPhone will run on a full charge, the tips here will all help. Each one on its own has a small effect, but all of them combined have a significant effect on battery life. Do as many of these as you can and you might make it through the day without recharging. 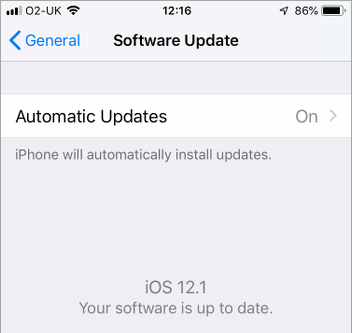 iOS sometimes causes problems for a few people and when a new major version is released there are often complaints that battery life has taken a turn for the worse. Sooner or later Apple releases an update for iOS that fixes the battery drain bug and all is well again. It therefore pays to keep on top of iOS updates and install them as soon as they are available. If you are having battery issues, an update might be the solution. Go to Settings > General > Software Update. It tells you if iOS is up to date and there is an option to download and install the update if it is not. There is also an option to enable Automatic Updates. Turn it on. Sometimes apps have bugs in that cause them to consume too much power and this runs down the battery more quickly. If you suspect or hear that it is a specific app, either manually update the app or turn on automatic updates. Go to Settings > iTunes & App Stores and turn on the switch next to Updates. Updates are a problem because the next app update could contain a bug that drains the battery. Updating apps can fix problems or create them where there were none, so the question is, do you update or note? My own preference is to turn off automatic updates and to update only when there is a problem or I really want a feature in the next version. I usually stick with an app if it is working OK and has all the features I need. When the battery level falls below a certain level, such as 20%, a message appears on the screen prompting you to enable low power mode. 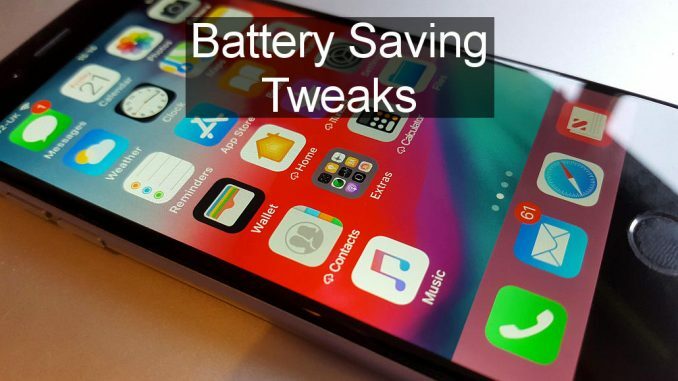 This limits app activity and some phone functions in order to reduce the power consumption and eke out as much life from the remaining battery charge as possible. To make the battery last longer, Low Power Mode can be activated manually. Go to Settings > Battery and flip the switch. Swipe to show the Control Center and drag the brightness slider down to the lowest level that is comfortable to see. This reduces the power consumption and so increases the battery life. The screen brightness can be a problem when using the iPhone in different situations. For example, after using it outside and setting the brightness correctly, it may be too bright indoors or later in the evening when the sun goes down. 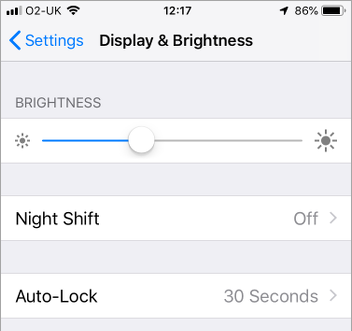 There is an auto-brightness feature at Settings > General > Accessibility > Display Accommodations > Auto-Brightness and turning on the switch helps a lot, but sometimes the screen can still be brighter than it needs to be. Sometimes it seems to get in a muddle on my iPhone and iPad and turn it right up. If you notice the screen is too bright, turn it down a notch in Control Center and this will reduce power consumption and extend battery life. 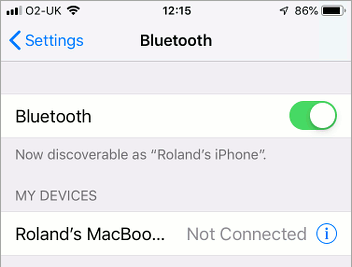 Although Bluetooth is a low-power wireless technology, it still uses some power and if you are not using it for anything, turn it off. If you need it during the day, turn it off at night. 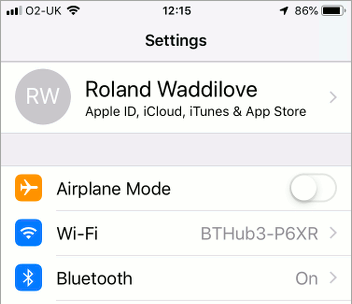 Do not turn off Bluetooth in the Control Center, go to Settings > Bluetooth and turn it off there instead. Control Center disables connections, but does not turn it off. 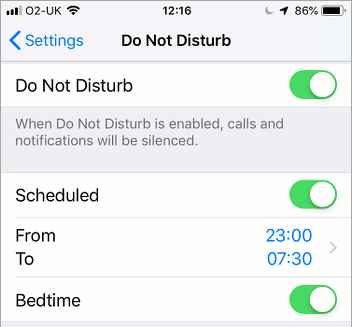 Do Not Disturb is a feature that is designed to stop notifications and sounds when you are busy doing something else, such as when you are in a meeting, asleep at night and so on. Notifications can turn on the screen, vibrate the phone and make sounds. All of these require power, so blocking them, as Do Not Disturb does, will use less power and so enable longer battery life. Use it whenever you can. Go to Settings > Do Not Disturb and turn on the switch. Turn on the Scheduled switch and set times, like at night, when it is automatically enabled. You and your iPhone will sleep better. Airplane Mode is a great way to save battery life and power consumption is reduced to a minimum. If you put your iPhone into flight mode overnight while you are sleeping, it will lose very little charge, sometimes as little as a couple of percent. It does this by turning off all radios – mobile, 3/4G, data, Wi-Fi and Bluetooth. This saves power, but it also has an effect on apps too. Apps cannot go online and check for updates, download data like emails and notifications, fetch or send information and so on. App activity is therefore reduced to a minimum and this also saves power. Enable it at night, at the cinema, and any other time you do not want to be disturbed and battery power will be saved. The phone tries to maintain a mobile connection and if there is no mobile signal it constantly searches for one. This uses a lot of power, so if you are out in the countryside walking, cycling, climbing, camping and so on, put it in flight mode if there is no signal. Enable it by pressing the plane icon in Control Center or open settings and tap the switch at the top. When the iPhone is put down or in your pocket, the screen remains on for a time and this is a waste of battery power. Sooner or later the phone will turn off the screen and sooner is better if you want to maximize battery life. Go to Settings > Display & Brightness > Auto-Lock and set the time to the shortest that is convenient for you. The latest iPhones can be unlocked simply by looking at them and older models by resting a finger or thumb on the home button. It takes so little effort to unlock an iPhone that you may as well set the shortest timeout available – 30 seconds. That will save power. Siri can be activated simply by saying ‘Hey, Siri’ and the personal assistant can be accessed even when the phone is locked. This may be convenient, but if Siri is constantly listening for that trigger phrase, it must be using power. Like everything else, it’s not a big deal, but every little saving helps extend battery life that little bit more. Turn it off. You can still access Siri in other ways – press and hold the side button on the latest X series or press and hold the home button on older models. 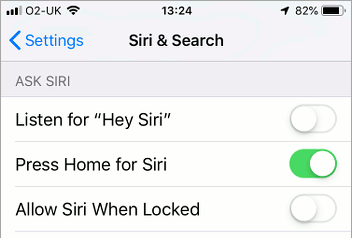 Go to Settings > Siri & Search and turn off the switch Listen for “Hey, Siri”. Some apps run in the background in order to perform various tasks, usually something related to messages, notifications and updates. For example, social network apps, photo apps, email, messaging, news and weather apps, and so on, can all run in the background. Some are essential but a few are not and by preventing apps from running in the background the phone will use less power and that means longer battery life. Go to Settings > General > Background App Refresh and there is a list of apps with switches. Turn off the ones next to apps that are unimportant. For example, you might consider Facebook unimportant or Apple News, and preventing them from running in the background can save power. When there is no Wi-Fi available and you are out with a laptop, the iPhone can be turned into your own personal hotspot. Then your laptop can connect to it wirelessly and get online, either for work or leisure activities. The Personal Hotspot feature uses a lot of power, so don’t leave it running and forget about it. Turn it off as soon as you are finished with it and not a minute longer. Go to Settings > Personal Hotspot and turn it off. The iPhone has some interesting wallpaper effects and they can be animated. However, this consumes extra power because the processor is working harder than with static wallpaper images. If you want to increase battery life, select a static image. Go to Settings > Wallpaper > Choose a New Wallpaper > Stills. Along the way you will see a message stating that dynamic wallpaper is disabled when Low Power Mode is activated. Even Apple doesn’t want it on when there is limited battery power remaining. Notifications can turn on the screen, vibrate the phone and make sounds. Limiting the number of apps that can show notifications will therefore reduce power usage and lengthen battery life. Go to Settings > Notifications and look down the list of apps. Are there any that are unimportant? What is important to you is not necessarily important to someone else, so which apps and notifications you block is up to you. I block Facebook for example, because the notifications are often trivial, and I run the app several times a day anyway, so I see notifications inside the app. I don’t need the iPhone screen lighting up every time someone posts something.